when i saw this deep nook of spectacular shelvery, located in the very center of our house, i knew i'd enjoy it. but i had no idea i'd be in love. it has two doors (interior painted peach!) and four deep shelves. first i wondered if we'd use it as a food pantry or linen closet or perhaps a place to house shoes (as this closet seems more well-endowed than any others). but on moving day–as we kept stashing our v.i.p. items inside it (as not to lose them amidst cardboard boxes and donuts and tools and warm bodies)–i realized its grand potential. it would be my cupboard of everything; the great go-to. playing the part of great houdini, as it would hide all my clutter–organized or not–inside its doors. i've been frustrated in the past as everything usually lands on the kitchen counter and remains there until well buried. my goal is to keep the shelves neat, cleaned out and organized. a happy working place rather than a stressful chaotic cupboard. possibly the best thing about it (not pictured) is the 6-disc cd player that rocks our house on a daily basis. a detail that was a surprise to us, but likely would have sold us on the spot. below i've listed some of the essentials for my go-to cupboard. my main tip for creating your own go-to spot is to pick a central location (think outside the box; utilize an over-the-door shoe hanger for pocket storage in that closet you keep the vacuum in), divide your items, label them and have totes easily accessible or you might forget that something cool was way behind the cd player (or is that just me?). do you have a go-to spot? any tips or must-haves? here are mine. + corkboard tiles (at target) for the inside of the doors to tack up notes, quotes, boden pages, good scripture verses, favorite found snapshots, kid charts and i love you's. + a small cooler for quick picnics; having it at the ready is the only way to go. + a gallon of paint (waiting for me) and small toolbox (for little tasks). 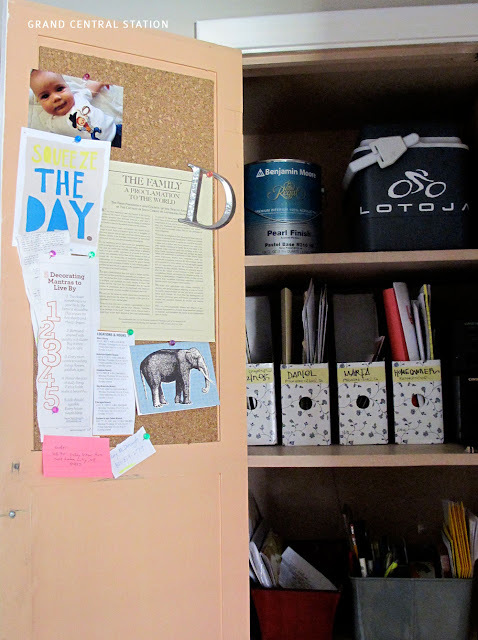 + ikea magazine boxes to divide and conquer (mostly mail and coupons). + i have one dedicated to magazines and catalogues ('tis the season). + a mail caddy loaded with pens, sharpies, stamps, packaging tape, note cards and address book. + a mini piggy bank for loose change. + a family calendar (hung on corkboard) for quick glances. + caddy for a few essential cleaning supplies (kids love dusting with microfiber dust mitts). + hand sanitizer ('tis the season). to entertain him while mama cooks or to do side-by-side in the morning hours. + a tote of quiet learning activities: abc magnets w/ small lightweight magnet board, string beads, foam alphabet letters (they aren't just for the tub anymore! ), mad-libs (i love mad-libs). + an art tote for crayons, coloring books, stickers and a play-doh set too. + a small crate of homemade instruments. these get lost in his other toys; so i like to keep them separate. now they are at the ready when a jam session hits. in other news // i thought this may be the last week of Home Is Where the Art Is posts, but to my luck, there are a few more small business owners that i have the honor of featuring. thank you for supporting handmade! psst... i can't wait to show you how the moving announcements turned out; i handed the responsibility over to another graphic designer and really loved what she came up with. on the docket // yesterday i made something (with fabric!) and documented it. it wasn't pretty but it did the trick beautifully. along with that silly tutorial, i plan on giving out one of my simplest, yet bestest parenting tips ever. also i'll be interviewing my favorite new author and finally unveiling our blue lily photo shoot. 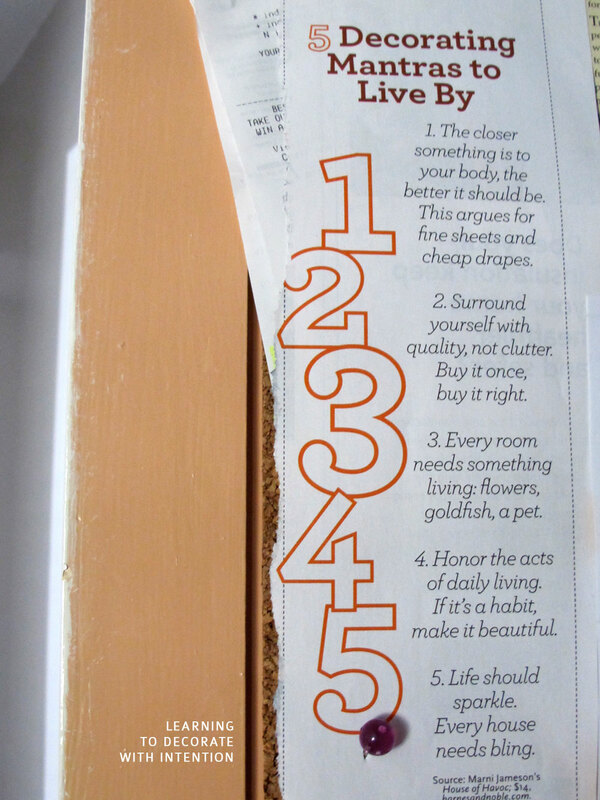 oh and more organizing tips too. thanks for indulging me. Ooh, I love your ideas! I don't have a cupboard I can dedicate to this, but you've given me some great ideas for cleaning up our computer "station." Thanks for the inspiration! We have an old pie safe that I keep in the kitchen, and have always called it "The Big Art Cupboard" as it stores all kinds of fun supplies for spur of the moment projects. what a happy space! I won't be surprised if you report back telling us about how opening this cupboard door makes you smile each time. What a treasure of a spot! Looking forward to whats on the docket. Will you come help me organize a "Go-to Cupboard" in my kitchen? It needs a touch of happiness that only you could apply! P.S. What's a pie safe? I don't know what it is, but from the name itself, I think I need one! I LOVE organizing tips and I love those mantras!